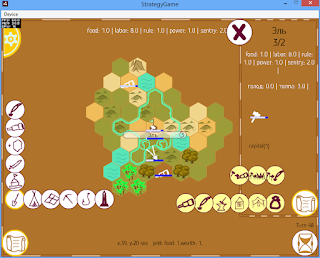 The game is a turn-based strategy with a focus to the strategic planning without a micromanagement. - diplomatic influence: rebellion inspirations, separating the provinces from the country, zone of influence expansion and annexing the satellites. Before the game starts you can select the water surface percentage, landmass type (pangaea, continents, archipelagos), the number of computer opponents, and the map size. In the left side of the game interface there is a strategic planning panel. When you tap its buttons, the subtasks selection will be open. Here you can assign the tasks by drawing on the map. - War. Select an Arrow, then tap on your territory to start forming an army. You can set the army's route by swiping. Also you can set the max army strength in this dialogue. - Outer policy. Here you can found the colonies. Also you can control, which ideas should be supported in your cities and in the enemies' cities. Check the detailed ideas guide below. - Territory expansion. Select which hexes must be included into your country first. - Science. For now only the marine branch of the science is partially implemented. If you live next to the sea you'll be able to explore ocean tiles and expand over the sea tiles eventually. Science interface will be out in one of the upcoming versions. You can play in turn-based mode or in real-time mode with pause. The moves control is in the bottom-right screen corner. Drag the game speed selector to set the game speed. It can be 1 move each 5, 2, 1, 0.5, 0.2, or 0.1 seconds. Tap the circle to pause/unpause the game. You can select the most left selector position for the turn-based game mode. Then each tap on the circle is 1 turn. If you are playing from PC, pressing Space key is equal to tapping the moves control. Food - gathered from fields, huner camps and fishermer villages. It's increased by the granary and used for population growth. Labor - gathered from mines, increased by the forges and used for city and terrain improvement. Power (Rule) - gathered from obelisks and barracks, used for territory expansion and ideas propaganda on your territory. Soft power (diplomatic influence) - generated by the temples, increased by the diplomatic academy, used for ideas propaganda on the enemy territory. Sentry - gathered from the hunting camps, used to explore the territory. Migration - generated by the cities which population is higher than their capacity. Used to found the colonies. Military power - generated by fortresses, increased by barracks, used in battle mechanics. Military power, which is produced by a province, is spread on its territory. When you create an army, part of the military power goes to it. Army needs military power to support its strength and heal casualties. When two armies are on the adjacent cells, the battle starts. The battle takes place also when one player's army is on the territory of another player. If the enemy's territory military control is reduced to zero, this territory is captured. If you capture a city, then you gain control over the whole province. When you tap your city a building window opens. In the top of it you'll see the current population level/current living capacity. Below there's a list of possible and available buildings. When you tap a building icon you'll see the info. And each building has a button to start/stop the upgrade. Buildings can be upgraded unlimitedly, just the upgrade price is getting higher. If the city has more population than the available living capacity, migration points will be generated. If at this moment a colony is being build, the migration points will be invested in its building. And when it's ready once citizen from the most overpopulated city will move there. 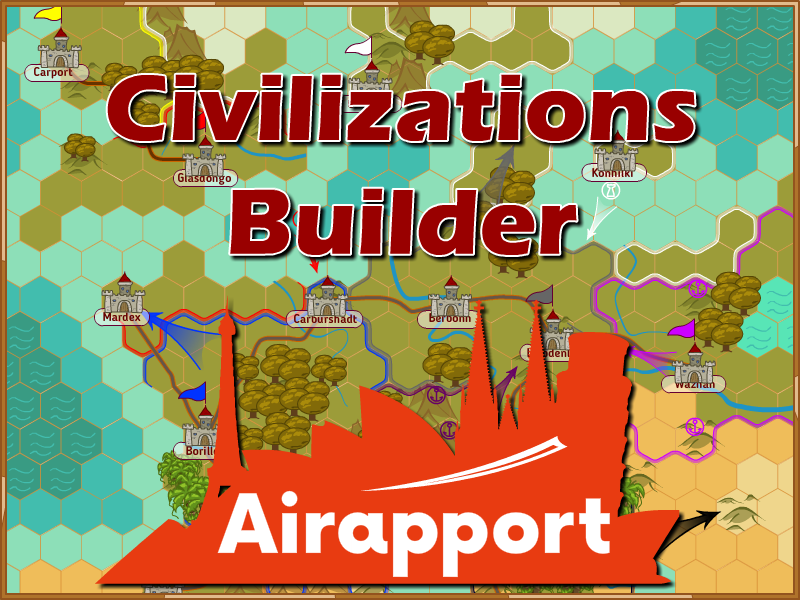 Otherwise, if no colony is being built, the citizen will just leave the city when enough migration points are generated. Political processes of the civilization are defined by the ideas, supported by the citizens. Those, who control the ideas will control the world's destiny. You can spread the ideas in your and foreign cities by using your diplomatic influence and rule. Every turn some of the current ideas supporters get bored of this idea and they give up. Then the countries, which have influence over the current city, for new supporters (of those citizens who don't currently support any idea). And, finally, the supporters of the strongest idea, spread it among the neutral citizens. When the support of one of the ideas exceeds 50% the political situation of the country or a city is changed. Being happy of the current situation. By default this idea is set in your own cities. Joining your country completely. You can spread it in your satellite's capital (the the country will be annexed by you completely) or in its cities, to annex it gradually. Including the country into you sphere of influence. You can spread this idea in the capital of an independent state. If you succeed it will become your colony (satellite). Rebellion. You can spread it in the cities of your rivals to make them break apart. Or, if you became a colony of another country, you can start supporting the rebellion idea in your capital, to set you free. to propagate the ideas in your cities you'll spend Rule (generated by obelisks and barracks). and to propagate them in the foreign cities you'll spend soft power (generated by temples and diplomatic academies). You are welcome to test the game and share your impression in comments. Can you implument real resources and cost for every building ? Yes, natural resources will be in the game. And all the buildings cost in Labour. What version: mobile, web or downloadable? The micromanagement near the middle to end of the game gets insane. Can't even tell if any of my towns rebels, or where the remaining enemy's are, and if they've attacked one of your unprotected colony's. How Much labor dose it take to expand ? Land expanding takes not labor, but Rule now. You'll need 10 rule for the 1st cell, and then 1.5x more. I'll make the appropriate informer. But also working to make this model better. Do you ever intend to implement save (autosaves as well) into the game? 1Q: How many developers are there in your team. 1. Resource requirement for city building upgrades appear to be increasing but still act as if they were still at its base numbers. 2. When you create another city it is made of a different civilisation? I keep having to invade my new cities. Hey would you be able to change the background on the map to distinguish it from the rest alittle more. Um sorry to be a bother but how do we create an army ? No problem :) 1. You select a sword. 2. You select an arrow and tap on one your highlighted cells. How do you save game progress? Thank you! Build a tower somewhere on your lands. 1.) Can a city have some economical border? Like a red border so you know which tile your city benefits. 2.) Once you conquered a city, the improvement in the tiles that was built around the city retains it color, i think it should also change color, it leaves an impression that those tile does not belong to you. I'll hive this game a perfect 5/5 in the playstore. likewise you could mix soft and hard caps together, making conversion possible when either one has bigger comparative or overall dominance in the city, or prevent somebody from conquering a city having less than 0% dominance for example.